For the seventh straight game, St. John's was without sophomore standout Marcus LoVett, and his fellow sophomore star Shamorie Ponds also missed this one due to an injury he suffered Thursday against Providence. The Red Storm trailed Seton Hall by as many as 15 points in the second half, but they narrowed their deficit to just one in the waning minutes of the contest, but proved unable to completely erase the disadvantage. For the second time in the team’s last three games, Justin Simon narrowly missed the program’s first triple-double since Ron Artest in 1999. The sophomore from Temecula, Calif., tallied 15 points on 6-15 shooting, a career-high 10 assists, and eight rebounds. Simon became the first St. John’s player since Sir’Dominic pointer on Dec. 7, 2013, against Fordham to record double-digit assists in a game. Tariq Owens set a pair of career-highs and notched his second double-double of the season with 19 points on a superb 8-12 from the field, including two three-pointers, and 14 rebounds, and also racked up four blocks. Marvin Clark II poured in 18 points on 6-of-11 shooting, including a 4-of-7 effort from beyond the arc, while Bashir Ahmed chipped in 16 points (6-14 FG, 3-4 threes) and four boards. 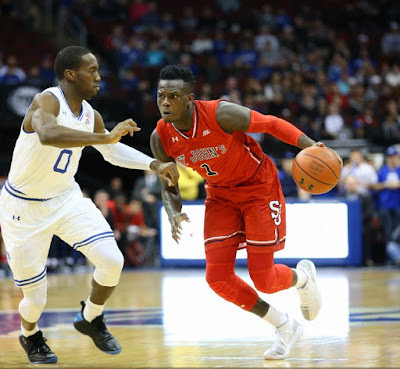 Seton Hall was led by Khadeen Carrington, who had 24 points on 6-13 shooting, including 5-10 from behind the arc, with five rebounds and two assists, and a big three steals. Desi Rodriguez had 23 points on 8-19 from the field, 4-9 on threes, nine rebounds, three assists, and a steal.